Which Wines to Serve for Thanksgiving? November – that time of year characterized by beautiful fall color, friends, family and traditional Thanksgiving feasts. It’s also the time that many of us are wrestling to decide which wines best complement the array of tastes, textures, aromas associated with our American holiday, as well as our guests’ varying palates. While there are no hard and fast rules about the “right” wines to serve at Thanksgiving, the Olympic Peninsula Wineries suggest the following food for thought. First, abundance and variety are key. You’ll never go wrong opening a few different wines and letting your guests serve themselves. There are plenty of good, affordable wines available today so offering variety doesn’t have to break the bank even in these tough economic times. Visit a local winery’s tasting room and sample a few in advance. Wines with lower tannin levels and less complexity are better suited to the mélange of flavors they are intended to complement. Think refreshing. With a big meal, lighter-bodied wines that continuously refresh the palate are a good choice, such as Sauvignon Blanc or Pinot Gris. Stay away from big, buttery Chardonnays. Lighter-bodied reds include Sangiovese and Pinot Noir. If you prefer to serve one wine to carry through the meal, consider a Riesling or a dry to off-dry rosé. Both of these wines are nice complements to turkey with all the fixings. For dessert, Port pairs nicely with pumpkin and pecan pies. Many travelers took advantage of the opportunity to purchase their “Passports” on line before departing on the Olympic Peninsula Wineries’ first International Passport Wine Tour this past weekend. A quick click via the winery association’s website enables an easy, secure Pay Pal transaction in advance of all wine tours. Visitors paired wines crafted locally from old world origin grapes with a selection of foods from some of Europe’s most famous wine growing regions. New taste sensations were discovered, including Sorensen Cellars’ Viognier and goat cheese canapes with apricots and almonds, and Olympic Cellars’ Dungeness Red Lemberger Wine and Alsatian Tarte Flambee.A good time was had by all. 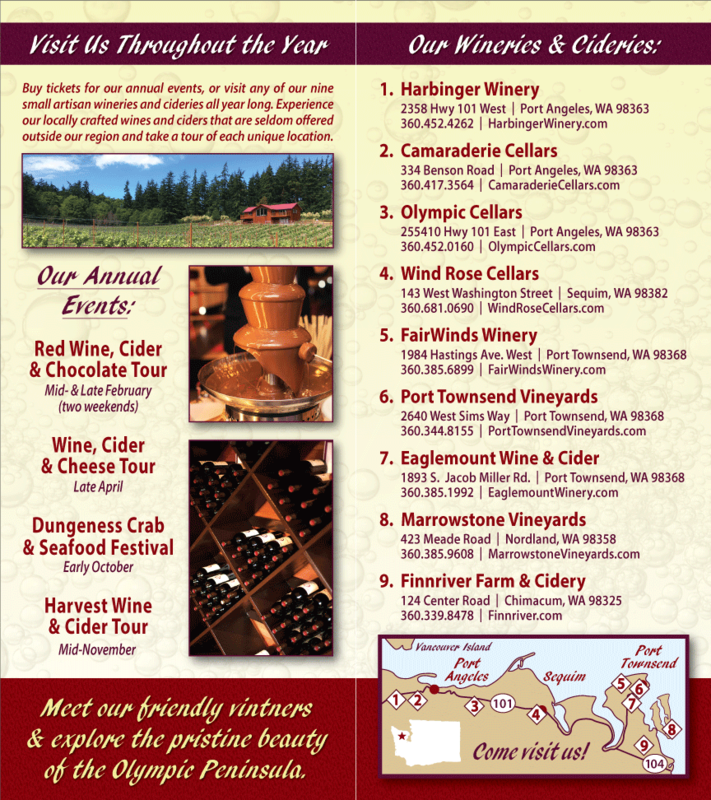 The Olympic Peninsula Winerie’s next event will be the Red Wine & Chocolate Tour. This two-weekend event will take place on February 7-8, 2009 and February 14-15-16 (Presidents’ Day Weekend). More information is available at www.olympicpeninsulawineries.org. Get your advance tickets on line now!